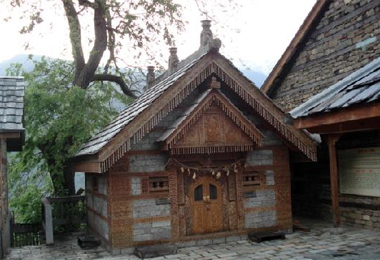 Naggar is an extremely small town in the Kullu district of north Indian state of Himachal Pradesh. Way back in 1460, it was the capital of the Kullu Rajas. This place has a number of attractions for the tourists in the form of forts, temples and museums. By exploring these attractions you can easily get a sneak-peak into the rich historical past of the region. If you are thinking about exploring this place during your vacation then you without thinking much make a booking for heritage hotels in Naggar through Heritage Hotels of India. Hotel Castle is one of the finest heritage properties that offers a pleasant stay to both leisure and business travelers. Every room and suite offers an amazing view of the surrounding area. The castle was erected around 1460 A.D by Raja Sidh Singh of Kullu. After more than 100-years, the castle became a rest house and finally in the year 1978, HPTDC made it a heritage hotel for discerning tourists from all around the world. The interiors of the hotel are amazing where there is a use of exotic medieval stones in this wooden structure. The beautiful paintings of a popular Russian artist make the place even nicer. Have a comfortable stay while enjoying all modern luxuries.